The Icom IC-7610 made its world debut at the Tokyo Ham Fair August 19, 2016. 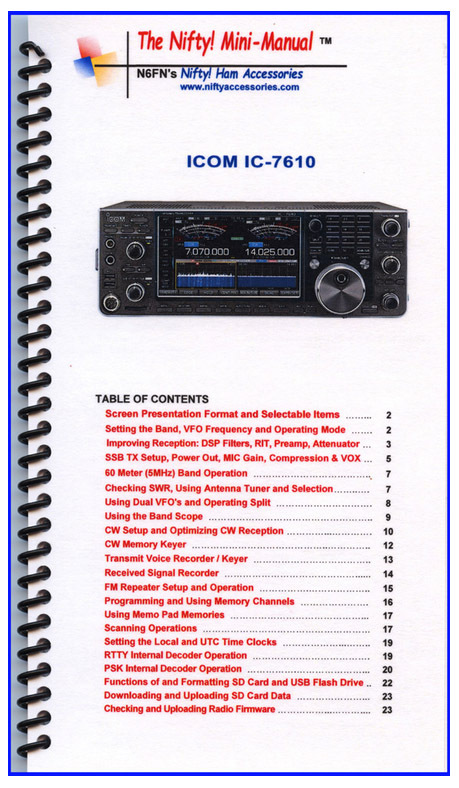 It provides professional performance in the 160 to 6 meter amateur bands. It introduces dual RF direct sampling receivers achieving 100dB RMDR. Each receiver has separate DIGI-SEL preselectors, separate Band Pass Filter networks, feed two separate A/D converters into the FPGA. The IC-7610 also comes with a high-speed, high-resolution, real-time spectrum scope on a 7-inch color display. The IC-7610 employs an RF direct sampling system, where RF signals directly convert to digital data and then processed by the FPGA (Field-Programmable Gate Array). This process reduces distortion that naturally occurs in the various mixer stages found in traditional superheterodyne receivers. The RF Direct Sampling System in the IC-7610 is capable of up to 110 dB RMDR. This performance gives you the ability to pull weak signals out of the noise of strong adjacent signals. There is a difference you can actually hear as the desired signal comes out of the pileup! It provides 100 watts of power and features a built-in antenna tuner. It has a large color touch screen display and supports and external monitor. The TFT touch LCD offers intuitive operation of functions, settings, and various operational visual aids such as dual spectrum scope aligned vertically or horizontally, simulated analog meters and RTTY, PSK31/63 mode decoded messages. The rear panel has BNC jacks for receive antenna, transverters, reference input, etc. Other enhancements include: SD memory card slot for saving data, I/Q signal output, Memo pad stores up to 10 operating frequencies and modes, Quick split function, Quick Dual watch function, RF gain and squelch control with a knob, RIT and TX variable up to 9.999 kHz, UTC/local clock and timer function, 1 Hz pitch tuning and display, Dial lock function, Adjustable main dial brake, External speaker jacks for Main and Sub receivers, Screen saver function, Multi-function meter (S-meter, Power, ALC, COMP, SWR, ID, VD and TEMP) and Auto tuning step function. This radio requires 13.8 VDC at 23 Amps. The IC-7610 comes with HM-219 hand microphone, DC power cable, plugs and spare fuses.